This blog post originally appeared on ModifiedMama. Lyllyan blogs at Modifiedmama.com about being a 'disabled' parent. 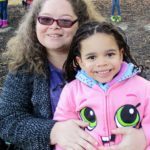 Her goal is to advocate for, educate about and bring awareness to the ever-expanding population of parents with disabilities. She can be found on FaceBook at @ModifiedMama and also writes for The Mighty. Her future goals are to lobby at the Congressional level for disability rights and to run in the Ms. Wheelchair Tennessee Pageant!